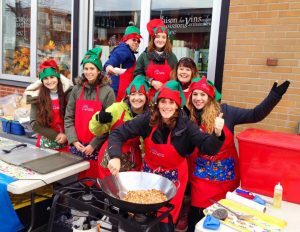 The Little Elves have created a tasty mix of sweet & spicy nuts which they sell throughout the Fall at Jean-Talon Market. Our kiosk is in operation weekends in September, October and November in front of the Marché des saveurs du Québec store. The kiosk is the Little Elves’ main fundraising activity and it also allows it to raise awareness about AIDS and isolation. Starting in September, we will be recruiting dozens of volunteers lend a hand in the kiosk, packing and selling the nuts and talking about the Little Elves and their mission. The kiosk runs Saturdays and Sundays, weather permitting. We received our gifts last week — Little Elves are awesome! Whatever would we do without you? Our PLWHIV look forward so much to what you send.